So, we’ve never had it so good. Things are just great, we’re told. Frankly, I don’t see it and I know lots of others who don’t either. Claims like that can get right up people’s noses. Which is why I’m not going to proclaim that you’ve never had it so good with new cars. But let me whisper it (if such an option is available in print) that things are moving rapidly in that direction. 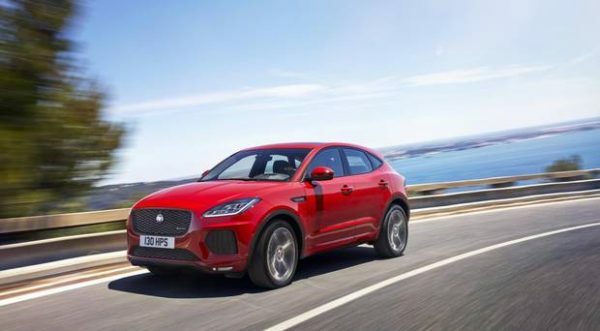 I mean a few years back, I could never have envisaged driving a baby Jaguar SUV, yet, I’ve just been doing just that with a salubrious version of the new ‘cub’ – the E-PACE. It attempts to do several things at once but mostly tries to make you feel you’ve never had it so good in, and with, a car. I think it succeeds in maintaining some parts of that illusion much longer than others. First off, there is the undoubted vibe you’d expect from anything bearing the Jag name. Then there’s the appealing chunky look, 20ins wheels, wide tyres – all essential on a thoroughly modern sporty SUV from the posh side of town. And my First Edition version was specced to the gills to sustain the illusion with all sorts of hi-tech luxury – it costs €77,000. Reality check: You’ll probably pay around the €42,000/€45,000 mark for the more accessible 2WD models. Prices technically start at €36,000. That’s a psychologically important figure because, with upper-end mainstream cars such as VW’s Tiguan being bought at €45,000 or so, Jaguar are pitching for a whole new generation of buyers at that level. They reckon 80pc of those who buy a ‘cub’ will never have had a Jaguar before. See why I’m whispering why we’ve never had such choice? I didn’t fancy the colour (black) of my First Edition. A bit gloomy. It’s a different car in red where design nuances flourish. Same goes for the dark interior leather. But, in a decently roomy cabin, some passengers loved it, which shows how varied tastes can be and why people resent being preached to when they know what they know. Me? I sat low and ‘engaged’ at the wheel, a position designed to make you feel ‘part of the driving’ vibe. I’m not a fan. I got the seat as high as possible, but my position was a compromise between over-viewing the high dash and the limited vertical adjustment on the steering wheel. I prefer the driving position in Audi’s Q3/Q2 and BMW’s X1 (though I still favour the Jag’s looks). The centre-dash spread and interface of instruments, buttons (thankfully a few), etc slopes nice and smartly, avoiding the eyesore of a big block of plastic with a jutting screen. The large touchscreen/infotainment system, Touch Pro, looked/worked exceptionally well for me. There are up to four 12-volt charging points and five USB connections. Dare I ask: Were you ever as well connected? Some passengers, rear-seat admittedly, were not as enthusiastic about their surrounds. They felt the cabin was dull. Again, no accounting for taste. They weren’t cramped back there, though, because room is quite reasonable. And a high score goes for the large boot (577 litres), thanks to the car’s 4,395mm length and 2,681mm wheelbase. Much of the E-PACE’s sportier-driving ambitions are linked to the dynamics of the great F-TYPE sports car. On the face of it, that should make the E-PACE a cracker. But as with many things (like being told you’re well off) it wasn’t quite. It’s a solid motor but, for me, lacked the handling verve I’d hope for. Handling and ride are not major tick-boxes for many buyers but they are important in a Jag. Men, reputedly, attach greater importance than women to such matters. I don’t agree but as there is a push for more male buyers of the ‘cub’, it was a tad disappointing; the ride at low speed felt a bit harsh, too. My 180PS 2-litre diesel was powerful and a wonderful cruiser, but in city driving it was still a bit too noisy for my liking. The steering felt a little heavy/sporty (depending on how you view it) but the car drove/cornered quite well – why wouldn’t it with all sorts of technology to aid grip and traction? The large tyres generated surprisingly little noise on motorways but could be harsh over rougher surfaces around town. With several driving modes, you can tune response/handling to suit you. But even with an excellent 9spd auto box and a lot of motorway driving, I’d hoped for better than 7.7-litres/100km (150bhp models should do better). Overall then, the E-PACE is far from faultless but there is a charm, an energy, about it that most rivals (Audi Q2 excepted) lack. Making it so relevant is lower-end pricing that courts those buying upper-end mainstream motors. And let’s be honest: a ‘baby Jaguar SUV’ has a ring to it that’s hard to ignore. For me, reality intrudes on a number of fronts but the E-PACE is still good enough to maintain a ‘good-times’ illusion on many others. Jaguar E-PACE compact SUV, 2-litre AWD 180PS (€390 tax) First Edition automatic. Road tax from €270 for entry-level 150bhp front-wheel-drive manual. Range starts €36,000. First Edition on test: €77,425. Test-car spec includes: ebony Windsor leather upholstery/flame-red contrast stitching, ebony suede headlining, Touch Pro, Connect Pro including Android Auto, Apple CarPlay), InControl Apps, Navigation Pro, 4G Wi-Fi hotspot, Meridian sound system, interactive driver display, advanced driver assistance systems, head-up display, 20ins alloys, LED headlights with DRLs, 18-way heated front seats with memory.